This page features a free printable Map Of Virginia. 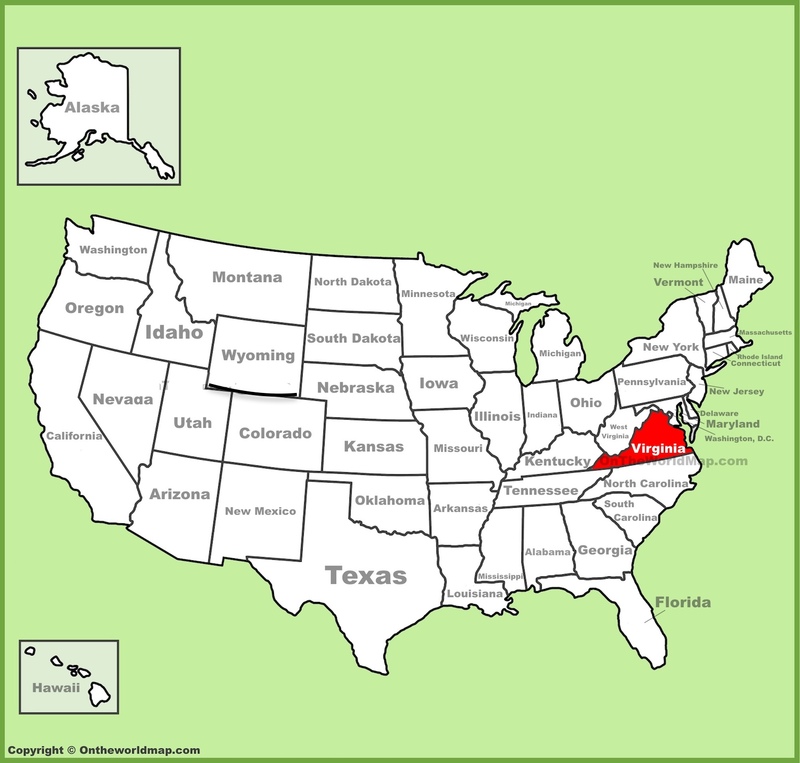 The above US map shows the location of the state of Virginia in relation to other US states. On June 25th of 1788, Virginia became the 10th of 50 states admitted to the Union, and was one of the original 13 colonies. Scroll down to find fascinating facts about the state of Virginia. Virginia's biggest cash crop is tobacco. Virginia has a higher percentage of vanity license plates than any other state in America. It is estimated that more than half of all internet traffic flows through northern Virginia. The first British colony to settle in America was at Jamestown, Virginia in 1607. Within three years, 9 out of 10 Jamestown settlers had died of disease and starvation. Roughly 62% of the state of Virginia is forested land. Williamsburg, Virginia is home to the Presidential Pet Museum, where you can learn about FDR's beloved dog Fala, Calvin Coolidge's lion cubs, George Washington's favorite horse, and others. Virginia has a statewide system of independent cities, which are not under the jurisdiction of any county. Only 3 independent US cities are NOT located in the state of Virginia - Baltimore Maryland, Carson City Nevada, and St. Louis, Missouri. Eight US Presidents were born in Virginia. They are George Washington, Thomas Jefferson, James Madison, James Monroe, William Henry Harrison, John Tyler, Zachary Taylor, and Woodrow Wilson, in that order. Virginia is the largest producer of seafood on the Atlantic coast. The 10 largest cities in Virginia (by population size) are Virginia Beach, Norfolk, Chesapeake, Arlington, Richmond, Newport, Alexandria, Hampton, Roanoke, and Portsmouth, in that order. Above: A Map Of Virginia depicting cities, land features, and surrounding states.